Margaret Arthur works in oil, acrylic, pastel and collage. A native Clevelander, she has long been on this area’s art scene. In 1997 she had a solo show at Cuyahoga Community College’s Metro Campus in Cleveland. She has exhibited in the Butler Institute of American Art’s Mid-Year show, at Ursuline College, and several times at Gallery West in Parma, Ohio. 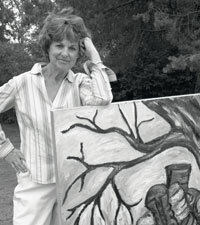 In 2001, her newest “shoe” paintings were exhibited in “Heel to Toe,” a group show at the Smithtown Arts Council in Long Island, New York. Arthur holds a BFA from the Cleveland Institute of Art and an MFA from Kent State University. From 1984-1998 she was an Art Instructor at Cuyahoga Community College and from 1995-1999 she taught art at Orange Art Center in Pepper Pike, Ohio.